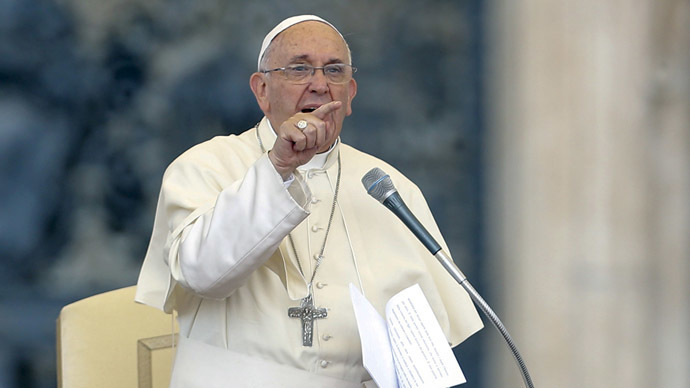 Pope Francis may go down in history as the Catholic leader most actively supporting divorce, after saying the practice was “morally necessary.” However, the pontiff’s position could face obstacles at an upcoming bishops’ meeting. The Catholic Church is known worldwide for being staunchly anti-divorce, but according to Francis there are certain moral imperatives, which make divorce a lesser evil. He was talking about the humiliation a wife could suffer at the hands of an abusive spouse. Also, if there are children, their safety must be considered. The Pope’s remarks come ahead of an important bishops’ conference set to mull over many issues Catholics consider crucial, including whether remarried divorcees can take communion. “There are cases in which separation is inevitable,” Francis told an audience gathered on St. Peters Square. Francis, elected two years ago, has gained prominence and infamy – depending on where you stand – for promoting an alternate outlook on things such as homosexuality and divorce. But the pontiff has made it clear the aim here is for an inclusive society, a view supported by Catholic liberals, who have shown support for a continued push towards freedom for all at the upcoming three-week Synod in Rome this fall. Nevertheless, there could be more than a bump ahead for those seeking reform, as a document released earlier this week practically eliminated any chance of reversing the current ban on communion for divorced Catholics who remarry. While the paper – also known as an instrumentum laboris – tries to balance out the modern with the traditional, some continue to see it as a repeat of what the Church said last year. The paper, widely seen as a barometer for things to come in October, instead sets its sights on reaffirming the Catholic Church’s position on practically every matter reformists are opposed to, including the ban on birth control.